Binding circles were bad news, my uncle said. Since I was currently trapped in one, the word understatement came to mind. 'You think its going to be that easy to escape?' Across the field from me, the graying man snickered. The sun was just about to set, and the odds of help coming from somewhere in Middle of Nowhere, Montana were slim. 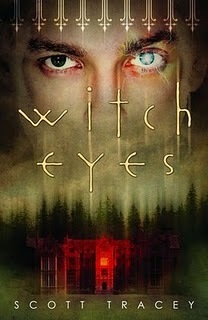 After a terrifying vision reveals imminent danger for the uncle who raised and instructed him, Braden retreats to Belle Dam, an old city divided by two feuding witch dynasties. As rival family heads Catherine Lansing and Jason Thorpe desperately try to use Braden's powers to unlock Belle Dam's secrets, Braden vows never to become their sacrificial pawn. But everything changes when Braden learns that Jason is his father--and Trey, the enigmatic guy he's falling for, is Catherine's son.To stop an insidious dark magic from consuming the town, Braden must master his gift—and risk losing the one he loves. From the start of the book, I loved Braden. He is such a sensitive soul, who has never been to school and is suddenly thrust into the world of high school drama. He really wore his heart on his sleeve and fell for Scott in a big way. This is the first book I have read that had a gay relationship in it and I found it extremely refreshing and heartwarming. Scott has created a beautiful relationship. However, this relationship is hindered by the Capulet and Montague warring traditions that made Romeo and Juliet so famous. Braden and Scott come from opposing sides and their relationship can only be doomed. You are never quite sure which is the right side to be on. This book took me back a quite a few years to a series set around a rather unusual town called Twin Peaks. Who remembers Twin Peaks? Well, this book had that feel to it. The town of Belle Dam has some unusual and very clever aspects to it that really made me think. In fact, I found the town of Belle Dam to be a character in itself; full of magical elements hidden from the human eye. A couple of the characters surprised me in this book and I found myself feeling a little double crossed. Never assume that what you see in a character is real in this book, as they may have a hidden side that is yet to be revealed. The ending was certainly explosive leaving a couple of strands to ponder over. I am certain that a second book is being created and hopefully these unanswered questions will be dealt with. I had one really big issue with this book and it is by no means the fault of the author. The blurb on the back of the book gave away two huge spoilers about the book , revealing events to me that did not happen until midway through the book. I would urge anyone reading this book, not to read the blurb on the back as it will spoil your enjoyment of the book. Issues aside, this was a brilliant read that took the Romeo and Juliet story and gave it a refreshing and original feel with a paranormal twist. I look forward to reading the next book in the series. Great review. I do remember Twin Peaks too! Don't you hate it when blurbs or summaries give away key elements. That cover is seriously creepy! This book talks about Romeo and Juliet? I thought it was a thriller ! Thanks for setting it straight! Jenni - I loved it. I can't wait for the next one. Sheila - Twin Peaks should be brought back! Bermudaonion - the cover is awesome. I have to say I was attracted to that first. Krazzyme - it has a similar style of story to Romeo and Juliet. Loosely based I would probably say as it is a thriller too. Blodeuedd - I love creepy covers. Do you know I have been using the Romeo & Juliet comparison a lot lately in the library - how weird is that. You already know I want to read this book. Watching the book trailer 4 times a day for 2 weeks has me chomping for it lol.